Barely three weeks to its national convention and presidential primary, the main opposition political party, the Peoples Democratic Party (PDP), has foreclosed the option of picking its presidential candidate for the 2019 election through consensus arrangement. This is coming at a time PDP leaders are making moves to prune down the number of presidential aspirants to six, who will battle for the presidential ticket through balloting at the national convention schedule from October 5-6. Daily Sun gathered that the PDP leadership and stakeholders, looking for a way to ensure non-contentious presidential primary, have settled for the emergence of its candidate through a process which would see all contestants going through an election, wherein delegates would vote. Sources revealed that the PDP is opting for a democratic process to pick its presidential candidate in order to avoid an implosion, which may arise if a particular aspirant is pre-picked ahead of the party’s national convention. It was gathered that the PDP, in a bid to have a united front after the presidential primary election, wants all aspirants to contest and be voted for, so that when the winner emerge there would be no allegation that the aspirants were not given a level-playing field. Competent sources, however, told Daily Sun that in opting for balloting to pick the presidential candidate, the PDP is looking for someone who has the stature to win the presidential election at the end of the day. Towards this end, it was gathered, the PDP has listed some qualities its candidate should possess. Sources revealed that the PDP stakeholders want a candidate who is, first, accepted in the North, where the Presidency has been zoned. In this regard, the party is looking for a candidate who the North, as a zone, including traditional institution, the elite and down-trodden, would accept as its own, especially since the major opponent, President Muhammadu Buhari, has a northern appeal. The fear, it was gathered, is that a candidate not acceptable to the North would not stand a chance against President Buhari, candidate of the All Progressives Congress (APC). Daily Sun gathered that the PDP is also particular about a candidate, who has popular appeal nationwide, not one who is considered sectional in association and orientation, so that he could easily get votes across the country. It was gathered that the PDP holds these qualities sacrosanct believing that in the presidential election it would be easy to sell such candidate to the generality of Nigerians as a better option to President Buhari. Sources revealed that the PDP is also working hard to ensure that there will be no acrimony among the presidential aspirants when the candidate emerges at the national convention, so that everybody would work for victory at the presidential election. The calculation is that those who would lose through democratic process in presidential primary would not feel short-changed, since it is a product of delegates’ votes, and therefore, would be willing to go to their respective states and strongholds to work for the party’s victory in the presidential election. It was, however, gathered that after the presidential primary, the PDP and the presidential candidate would meet with other aspirants and agree on compensation after the victory at the presidential election. However, there is an option that some of the aspirants could use proxies to obtain nomination forms for other elective positions, which they could fall back on after the presidential primary. The thinking is that with the window of substitution of candidates, such aspirants could take up the tickets of proxies for other elective positions. In a related development, PDP leaders are making frantic efforts to reduce the number of its presidential aspirants to not more than six. Daily Sun reliably gathered yesterday that the move to reduce the number of presidential aspirants is spearheaded by the PDP Board of Trustees (BoT). The PDP leaders are apprehensive that if all the aspirants are allowed to go for the presidential primary, the party may not be able to effectively manage issues that may arise in the nomination process. An ad hoc committee set up by the BoT is scheduled to meet with the presidential aspirants in Abuja today, apparently as part of efforts to scale down the number of aspirants. The BoT chairman, Senator Walid Jibrin, had earlier mooted the idea of getting the aspirants to agree to a consensus candidate from among them, which did not go down well with several of them. A total of 13 aspirants obtained the PDP presidential nomination and expression of interest forms to participate in the party’s presidential primary. They are: former Vice President, Abubakar Atiku; Senate President, Bukola Saraki; former chairman PDP National Caretaker Committee, Ahmed Makarfi; Sokoto State governor, Aminu Tambuwal; Gombe State governor, Ibrahim Dankwambo and former Minister of Special Duties, Taminu Turaki. Others are former Senate President, David Mark; former governor of Kano State, Senator Rabiu Kwankwaso; former governor of Jigawa State, Sule Lamido; former governor of Sokoto State, Attahiru Bafarawa; former governor of Plateau State, Jonah Jang the founder of Baze University, Senator Datti Baba-Ahmed and Stanley Osifo from Edo State. As part of efforts to reduce the number of presidential aspirants, party leaders in the three geo-political zones in the North are said to be talking with presidential aspirants to arrive at a consensus, to brighten the chances of their zones in clinching the PDP ticket. Seven of the aspirants are from the North West, three from North Central and two from the North East. Daily Sun also gathered that the presidential aspirants have equally intensified negotiations among themselves, with the aim of getting some of them to withdraw from the contest. Senator Makarfi, who is one of the presidential aspirants from the North West, confirmed to Daily Sun in a telephone interview that the aspirants were discussing among themselves. A PDP leader from the NorthCentral, who did not want his name in print, told Daily Sun that some northern leaders were also talking with the presidential aspirants on the need for some of them to withdraw from the contest. According to him, “the Northern Elders Forum and the Northern Consultative Forum have been doing a lot. They have been talking to them. Basically, what they are trying to do is not to force anybody to step down. They want them to see reason to have a manageable number who would go for the presidential primary. Meanwhile, some of the presidential aspirants have continued to kick against the choice of Port Harcourt, Rivers State, as venue of the National Convention. 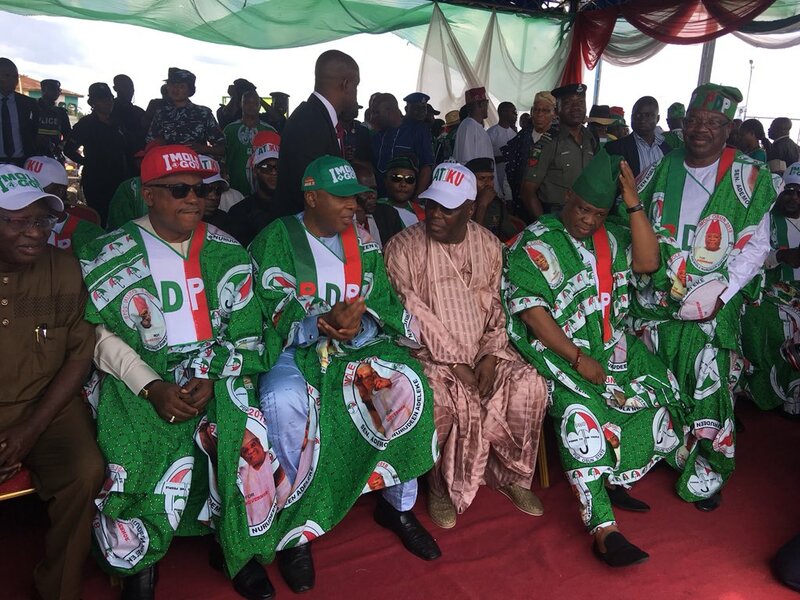 A party source told Daily Sun that owing to the misgiving expressed by some of the aspirants about holding the PDP convention in Port Harcourt, the leadership may consider a new venue.